But this one seems great! Both of my kids have enjoyed the nonfiction picture books we have read recently, and I am a big fan too. But here's the problem- choosing your goal. In an ideal world I'd love to do one every week, on Monday for Nonfiction Monday. But I do not have that much money! Twice a month might be doable, but nonfiction books seem to take longer to ship than other picture books. Many take 3 weeks to a month. So what if I run out of nonfiction picture books? So I've decided on 20 books for the year. Close to two a month, but gives me a little breathing room! You wouldn't think deciding this would be so hard, right? I am a little nuts sometimes. 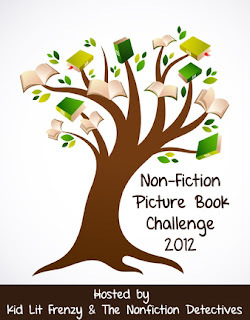 With that, I am going to participate in the Nonfiction Picture Book Challenge, and I will read 20 nonfiction picture books to my kids in 2012. Are you participating? Do you have any books I must include in my challenge? That is one fabulous list! Thank you!